The last Journey of the Last Plantagenet - involving the historic reinterment an anointed King of England - will take place in Leicester and Leicestershire on Sunday 22 March 2015. A cortege carrying the mortal remains of King Richard III will depart from the University of Leicester (which was my father’s alma mater in the 1930’s) through the country and city before arriving at Leicester Cathedral. His remains were found in 2012 beneath a Leicester car park, excavated from the chancel of the long lost medieval Greyfriars church. If you are interested in the discovery please see my earlier posts of 16 and 22 August 2014. 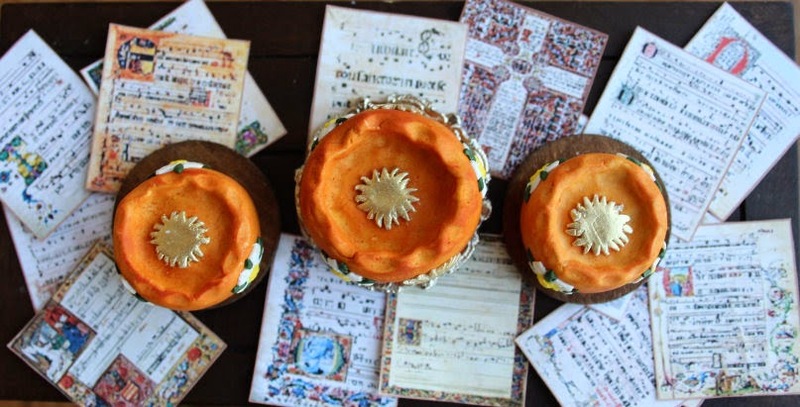 MedievalMorsels is marking these events with a pie bearing heraldic badges of the Yorkist Plantagenets, the white rose of York and the golden sun in splendor adopted by ancestors Richard II and Edward III. 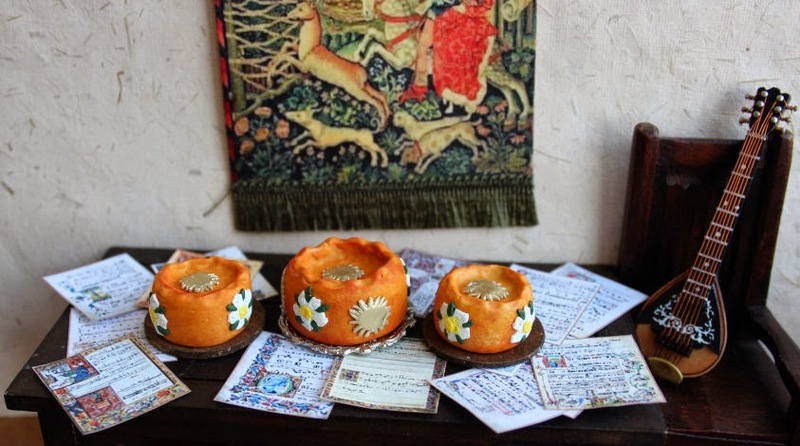 The sort of decorated table pie that a cook in a castle or manor would have baked for a feast hosted by his Lord and Lady for a visiting Plantagenet monarch, Richard III of one of his ancestors. 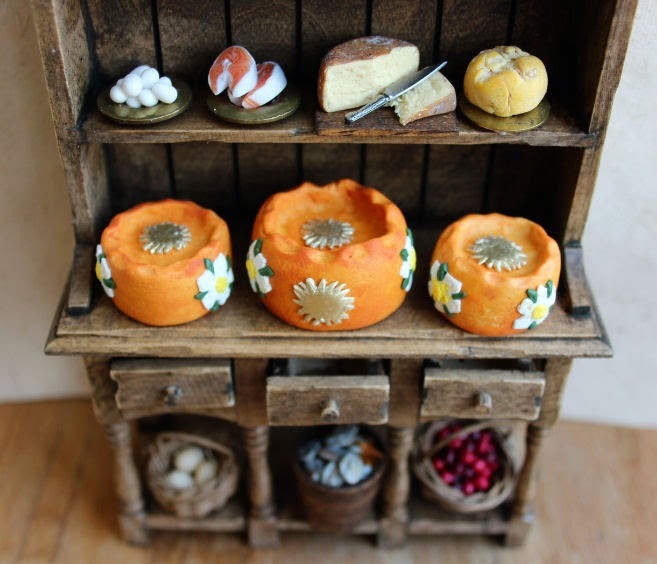 MedievalMorsels has created a 1:12 scale miniature Yorkist Plantagenet heraldic pie! It was more than 530 years ago that Richard III was crowned King of England. His coronation followed the death of his brother Edward IV and was approved by the Council and Parliament after the legal declaration that his two young nephews were illegitimate (since Edward was bigamously married, having previously been married to Eleanor Butler). The fate of these young boys, formerly in direct line of succession and who became known as the Princes in the Tower, is shrouded in mystery. But Richard is not known to have ever killed a woman, a priest, or a child, unlike the Tudors who came after him. 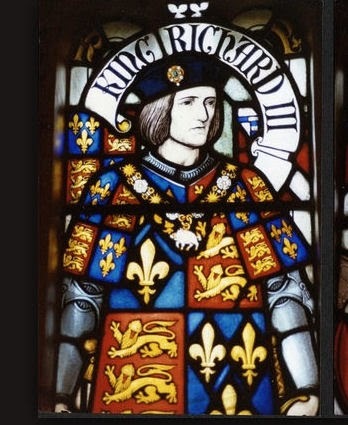 Richard III was England's last medieval monarch. Only thirty-two when he died, he was born at a time of civil strife in the country. Intermittent, full pitch battles between warring armies of Plantagenet cousins and their supporters broke out, raging for the three decades of Richard's life as rival dynastic claims to the throne were contested. First, towards the end of King Henry VI's reign when Richard's father the Duke of York strove to bolster the Yorkist claim, second the challenges to his brother King Edward IV’s kingship, and lastly and most calamitously for Richard III during his own short, reign of 777 days. Judging by impartial contemporary or near contemporary accounts Richard was, despite his slender frame and a spine seriously deformed by scoliosis (sideways curvature) from his teenage years, a skilled medieval warrior knight and a seasoned battlefield strategist. He was also an enlightened ruler, whose Parliament brought in reforms which are still in effect today - like the right to bail for those accused of crimes. Richard was from the Plantagenet House of York. The family badge was the white rose of York, but also adopted was the sun in splendor harking back to Edward III and Richard II. Recall Shakespeare's lines "Now is the winter of our discontent, made glorious summer by this sun of York" a pun on "son of York" in his play Richard III dated 1594. Richard's personal badge by which he and his supporters could be recognised was a "sanglier" or wild boar rampant (a hind paw on the ground, three paws raised off the ground), argent (silver but shown on heraldic flags and banners as white), armed (with tusks) and bristled (shown along the boar’s back in a different colour). As Joe Ann Ricca explains in an article published by the Richard III Society in August 2012, all sorts of household and military equipment would have carried his personal badge, which was also worn on clothes. Ricca goes on to explain that at the outset, there is some opinion that by choosing the badge of the white boar, Richard was identifying himself as an individual, separable from his rank, his family, and his in-laws, all of whom had their own particular emblems that he was entitled to display. The choice of a white boar for a personal symbol is not as obvious as that of a lion. But a boar signifies a valiant, wily warrior preferring to die than to save his life by flight. The records for his coronation in 1483 show that Richard ordered 13,000 badges of the white boar, one of these survives in the British Library. From the stained glass window in York Minster, the rampant white boars, heads erect, stand supporting the royal shield. 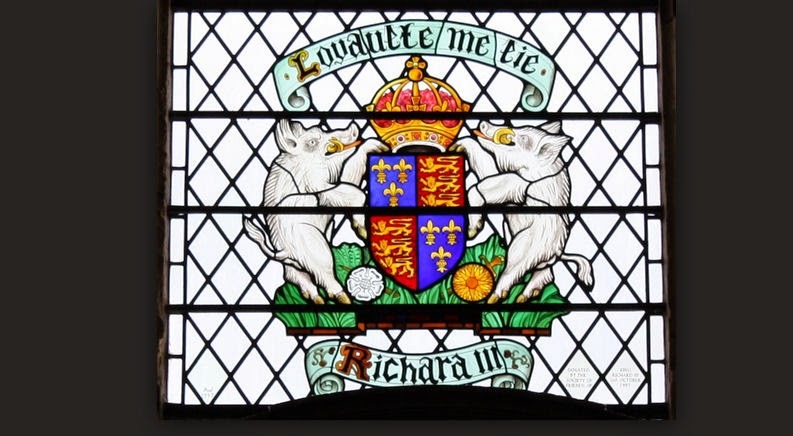 The well-known motto of Richard III “Loyaulte Me Lie” (Loyalty Binds Me) appears in a banner in the top of the window, and a banner with a name plate appears at the bottom. The white rose of York and the golden sun in splendor also appear. In this long standard flag a Boar passant (walking with three paws on the ground and the right fore paw raised) looks forward, armed, bristled, tail curled. All of this make the contemporary and somewhat later accounts of the abuse of Richard’s corpse after being slain at Bosworth Field more obscene, since we are told (1588) that his body was “despoiled to the skin”, was trussed behind his badge “as an hog or another vile beast and so all to besprung with mire and filth, was brought to a church in Leicester for all men to wonder upon and there lastly irreverently buried”. Some 532 years later, on Sunday 22 March 2015 all that will be put right. The people of Leicester and surrounding towns and villages, and those from much further afield watching simultaneous Channel Four television broadcasts can wonder and participate. Several days of solemn and reverential process will folllow, culminating in the reinterment of Richard III’s remains with dignity and honour on Thursday 26th March. This will be less than 100 steps from where he lay buried for over 500 years. But this time it will be in a way that at last befits a pious medieval ruler, the last Plantagenet King of England.